The Jabra Motion UC makes your mobile office complete by providing a full-featured Bluetooth® solution that unites your mobile and laptop-based voice channels. The Jabra Motion Office Headset you can use both at work and on the go. Nano-sized USB adaptor helps you easily connect to a PC. Find the best fit with a selection of eargels. Get best-in-class wireless range of up to 100 meters (300 ft). 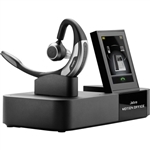 Jabra Motion Office UC lets you be hands-free on any phone you use be it mobile, desk or softphone.